My name is William M. Windsor. I had never been arrested, had never been charged with a crime, and had never been in jail prior to October 28, 2014. There isn't a lot to do in jail, so as I sat in the Ellis County Jail, I took notes and wrote. Here is my advice for how to prepare should you ever get arrested or detained by law enforcement. Always carry at least $100. The money in your pocket goes on your "books," and that's how you can afford to buy a phone card, toiletries, snacks, paper, etc. Always carry a Bible with key phone numbers, addresses, and a coded list of your credit card information. The jails take everything away from you, and a Bible is the only thing they may allow you to keep. Memorize several key contact phone numbers. Know landlines rather than cellphones, if possible. Memorize your credit card numbers, expiration dates, and security codes. Think about who you could truly rely on if you get arrested. Always carry your cellphone. Program it with names, addresses, and phone numbers. Enter toll-free numbers and addresses for your credit card companies and any other recurring expenses that you have (rent, utilities, telephone, credit cards) because you need to make sure your bills get paid. If you are arrested, tell the booking staff that your cellphone is your only source of phone numbers. If they allow you to go through it, work fast, and write down as much as you can. Put your credit card information in your cellphone, but code it so others could not figure it out. I listed my digits vertically. If you have a credit card with a large enough balance, you may be able to use it to bond yourself out. Give someone your vital information -- addresses, credit card numbers, bank account numbers, etc., so they can have it and mail it to you. If you trust someone enough, consider giving them your power of attorney. Set up your bills to be automatically paid from your checking account. Then as long as you have money, you are covered. Have contact information for your bank, attorney, accountant, doctors, dentist, pharmacy. Always carry copies of your prescriptions. If you have them, the jail will probably give you your prescription medications. I have now obtained prescriptions for socks, Tylenol, a toothbrush, and dental floss as these items are not allowed in the Ellis County Jail. You might be able to get them with a prescription. Keep your glasses with you at all times. Keep your mouth shut. Don't answer questions. If they ask you a question, tell them that you understand you have the right to remain silent. Do not speak without your attorney present. Should they claim you committed a crime elsewhere, demand to see the documentation that they have. Study it carefully for errors and omissions. Ask for your phone call right away. Make sure you get clothes and shoes that are big enough. Loose is good. Get clothes bigger than you would normally wear. When a nurse sees you, think carefully about anything and everything that has ever been a medical issue for you, and get them on the record. Have a good reason for a bottom bunk pass. Communicate any allergies. Don't go to a cellblock if you have any diseases. Know which toilets are treated as urinals and which are for sit-down use only. Wash your hands a lot. Don't touch things with your bare hands. Jails are a breeding ground for all types of germs. If you sing happy birthday twice while washing your hands, that is the amount of time needed to kill germs. Brush your teeth after every meal as dental hygiene is difficult in jail, and you don't want them pulling your teeth without novacaine. Don't touch anything that is not your own. Buy needed items from the commissary first. This is very important if there is a daily limit. If you can afford it, help those less fortunate. Demand law library access. Research your charges. Be ready for food trades. Help keep the cellblock stocked with toilet paper. Keep the hot pot filled. Do your part on sanitation. Keep your spoon and cup clean. Have integrity at all times. There seems to be more integrity in jail than there is on the outside. Be very respectful and try to develop a good relationship with the guards. Always say please and thank you. The smallest of gestures are big in jail. Share contact information with your new friends. Do not touch your nose, eyes, mouth. Use Inmate Request Forms (kites, I-60's). Request copies of everything. Check for errors and omissions. Compare to statutes. Know how to play Spades and Chess. Ask for your attorney's cellphone number. Try to be considerate of those trying to sleep. If you are young, learn. If you are old, learn, and enjoy the benefits of age in jail. Make sure your family is taken care of. Be aware that your social security payments will stop. Read carefully anything that you are asked to sign. Keep a diary. It passes some time and dates and times of events could become important to you. Go to the jail immediately, or get someone to do so. Have a credit card so you can put some money on your loved one's "books." If they had no cash on them, they have no funds in jail. Get information on the various ways to add money to an inmate's account. Distribute this information to friends and relatives. An inmate has no way to add money on their own, so it's up to folks on the outside. Don't abandon anyone in jail. They desperately need a lifeline. Find out when bail is set (usually the following morning). Find out if your loved one wants you to post a bail bond. Some may prefer to do their time. 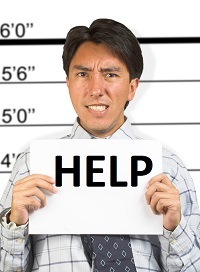 Call a bail bond company, and find out what they require. The fee is usually 10%, but the bail bond company will want security and a co-signer for the full amount. Can the bond be put on a credit card? Find out if a vehicle needs to be picked up. Take prescription medications, prescriptions, and glasses, if applicable. Ask your loved one if he/she wants you to come sign for his/her personal property (except clothes). Send mail, and ask others to do so. Check jail rules as to what is and is not permitted. Hire an attorney if you can afford it and your loved one wants one. If he/she is not indigent, a court-appointed attorney will not be provided. Run errands that are needed. Find out if your loved one wants to give you a power of attorney. If a loved one is arrested on a crime in another state, locate and print a copy of the extradition statutes for each state. Mail them to your loved one. Read the Advice to the Arrested, and think about what you can do. Realize that it is very had for your loved one to accomplish much of anything from jail. Read the complete story of the illegal arrest, incarceration, denial of bond, and denial of release of William M. Windsor. Incarcerated in Ellis County Texas on an alleged extradition to Montana. Part 1 is the background to the story. Part 2 discusses when Bill Windsor was handcuffed and taken to jail from a hearing in a civil suit that he filed against the people who have viciously defamed him in what is the largest case of defamation in U.S. history. Part 3 details early days in jail and attempts to get someone/anyone to help; the conspiracy to keep William M. Windsor in jail begins to come to light. Part 4 covers events from November 26, 2014 through December 2, 2014 as the corruption of Judge Bob Carroll erupts in full bloom. Part 5 introduces Ellis County Texas District Attorney Patrick Wilson into the corruption picture. Part 6 leads to a December 19, 2014 hearing at which Bill Windsor was ordered released by Judge Cindy Ermatinger.